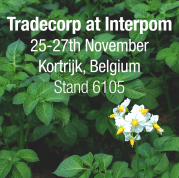 From the 25-27th of November, Tradecorp will be exhibiting at Interpom 2018, located at the Kortrijk Xpo center, in Kortrijk Belgium. Stop by stand 6105, to get a better insight on how to maximize the Return on Investment (ROI) of your potato crop. Tradecorp potato experts will be at the stand counselling on how to reduce stress, obtain more roots, as well as achieve more and bigger tubers to maximize your profitability. In addition, Vincent Claux, Tradecorp’s Technical Manager in Europe, will explain the techniques to maximize the profitability of your potato crop in his presentation “How to feed potato efficiently to get higher yield and quality”. If you would like to attend the presentation, do not hesitate to contact us to get your invitation! Interpom Primeurs is the most specialised indoor trade fair for the potato and vegetable sector in Europe where the whole chain is represented: from growing, to processing and marketing. It offers a complete, and above all, a sharply focused range of products and services for all professionals in the potato and vegetable sector: growers, contractors, processors, packers, buyers and traders of fresh and processed potatoes and vegetables from all corners of Europe – and increasingly, from other continents as well. Interpom takes place every two years, and each time it continues to grow and attract more people from around the world. At the past convention, there were 315 exhibitors from 14 countries and 20,000 visitors from 49 countries.